At the end of 2012 an EU directive came into effect, regulating the provision of tooth whitening products to the public. Only Dentists can now carry out this procedure legally and the patient has to be 18 years of age or older! Furthermore, the maximum concentration of Hydrogen Peroxide (which is the main active ingredient), that can be sold to a patient is 6%. This equates to a maximum 18% solution of Carbamide Peroxide (which breaks down into hydrogen peroxide on application). The provision of external tooth whitening can be carried out by two methods. Office or In-surgery application in the dental chair where the dentist can use higher concentrations of product which are usually activated by laser/ light exposure. 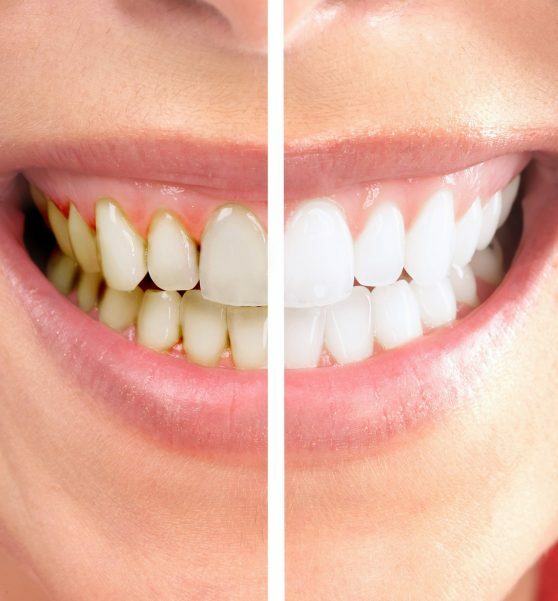 The results can be very fast and create a “wow” factor but there are concerns regarding the degree of drying out (desiccation) of the enamel over such a short period as well as less predictability in maintaining the final colour. In many cases this is addressed by supplementing with the second form of tooth whitening to prolong the results. Tooth sensitivity can also be quite high due to the concentrations/ time frame involved. I do not personally carry out this form of whitening in my own practice due to the concerns mentioned but there is limited evidence to indicate any contraindications to this type of whitening procedure. Home Kits where the patient carries out the procedure themselves at home. This involves two visits to the dentist… the first involves taking impressions to have a customised set of bleaching trays made up. On the second appointment, these are fit in the mouth to ensure a good seal. Furthermore, instructions are given to the patient on how to place the whitening gel in the trays and the duration appropriate to the specific gel being used. Any questions are dealt with so that the patient can easily manage the process in a gentle, easy manner over a timescale that suits themselves. Different people desire a differing degree of whitening and this is the beauty of the second approach as it allows more control and reduced sensitivity. If you have any queries ,please contact reception at Market Green Dental Care and we will be happy to address your concerns.